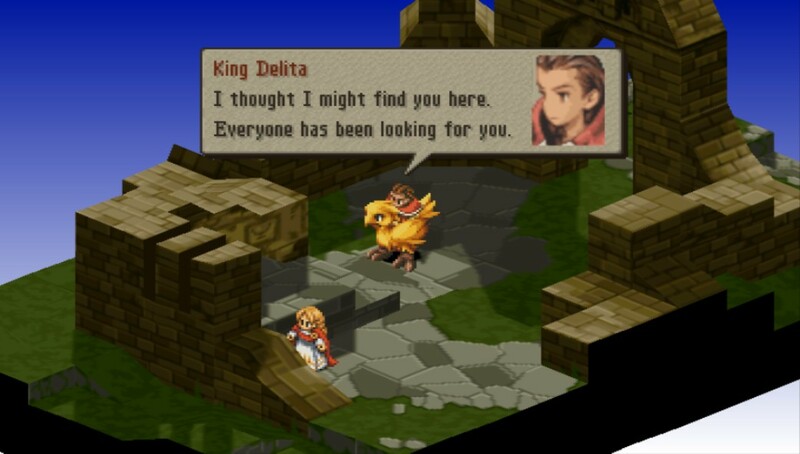 All of the Lucavi demons from this game show up in Final Fantasy XII, which makes an effort to bring Final Fantasy Tactics into the main series fold on some level. We've got Queklain, Velius, Zalera, Adrammelech, Hashmalum, Ultima, and Zodiark. Those last two are the strongest and treated as such in FFXII. 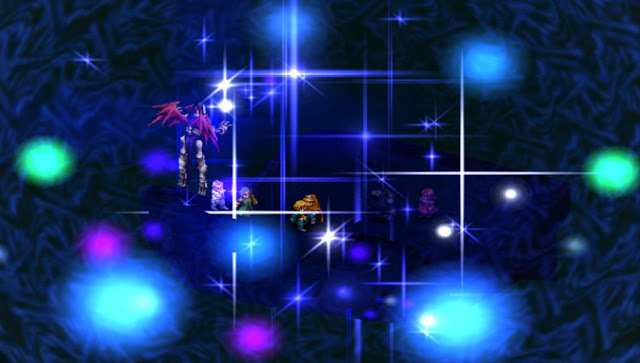 The other Zodiac demons that don't show up in FFT are Chaos (final form of FFI's villain, Garland), Mateus (final form of FFII's villain, Emperor Mateus Palamecia), Darkening Cloud (FFIII's final boss), Zeromus (FFIV's final boss) and Exodus (FFV's final boss). Then there's one that doesn't fit in anywhere: Shemhazai, the Whisperer. I'm not sure what the deal is there. Maybe it's from one of the Tactics Advance games. 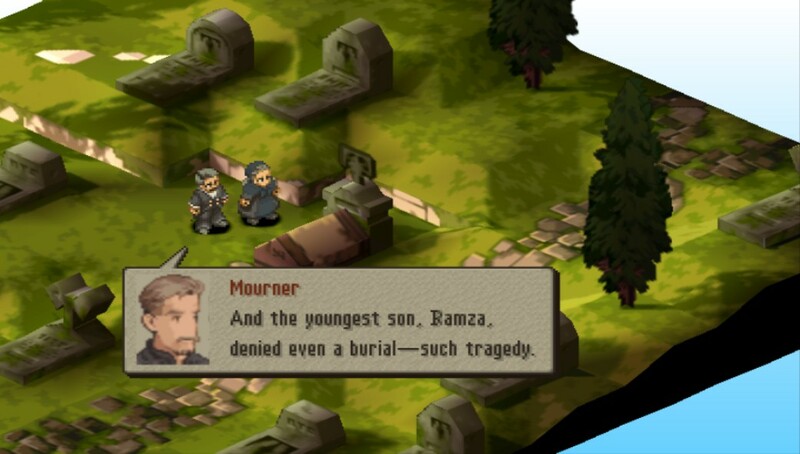 Seems very odd that they'd have one esper be an original monster among a sea of references to other games. 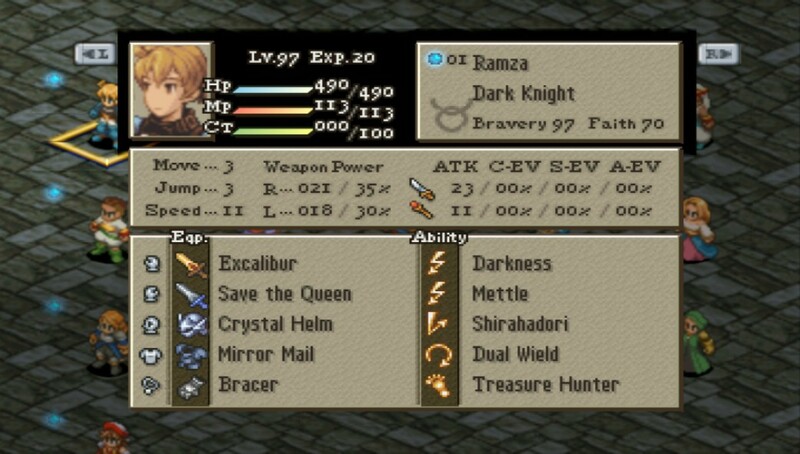 At this point, it's time to powerlevel Ramza a bit so that I can get the new PSP class, Dark Knight. I take him down to Mandalia Plains, where the living is easy and so are the random battles. Shirahadori, or Blade Grasp, is the main Samurai counter ability. It's also the most OP counter in the game, using Bravery to determine your block rate. 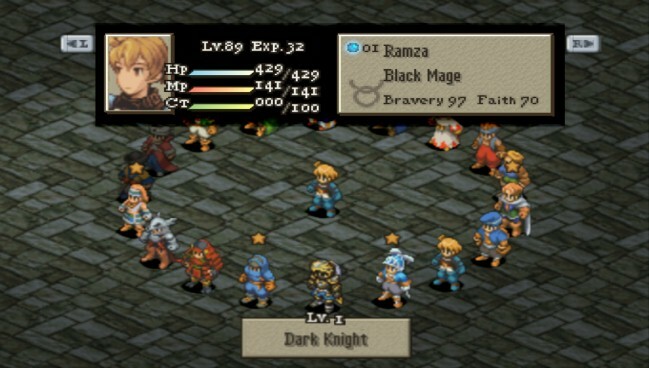 If Ramza's Bravery is 100, that means he blocks 100% of physical attacks. 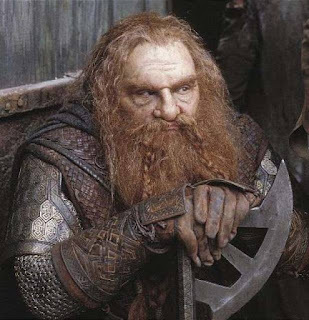 Most enemies will just stand there and look at him at that point. It breaks the game and isn't particularly fun. Here they are piling up and not doing anything. 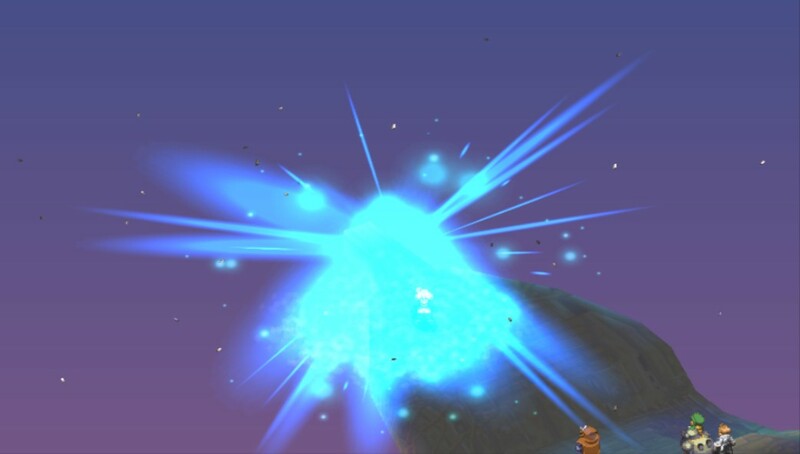 Spells and "special attacks" will still land, as long as they ignore physical block rate. 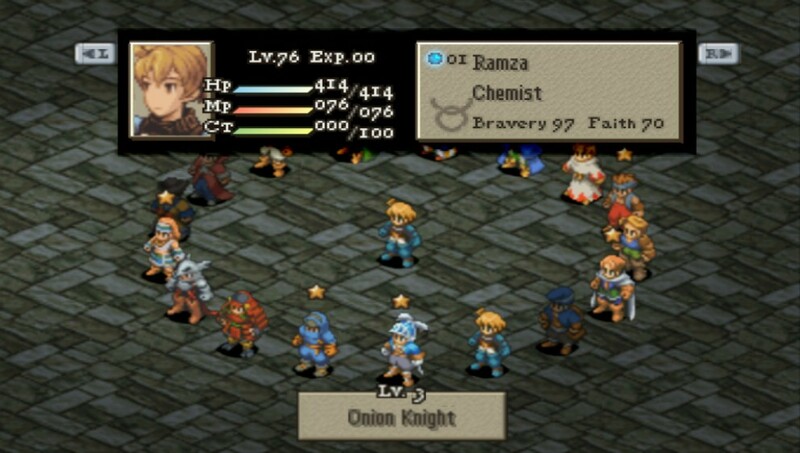 Raising Squire and Chemist levels on a character will unlock Onion Knight, a really bizarre class. They can't set abilities or learn any. ...I don't get it. Apparently Onion Knights get stronger the more classes you've mastered, and thus are highly-potent once you've gotten everything else done. Hopefully they have some abilities by then too. 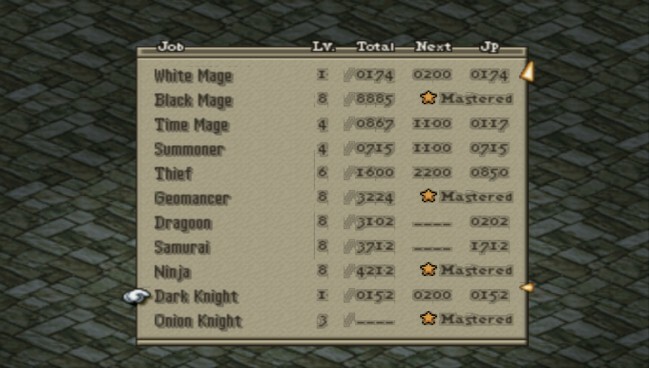 After mastering a bunch of melee classes (and Black Mage), our hero finally unlocks Dark Knight. 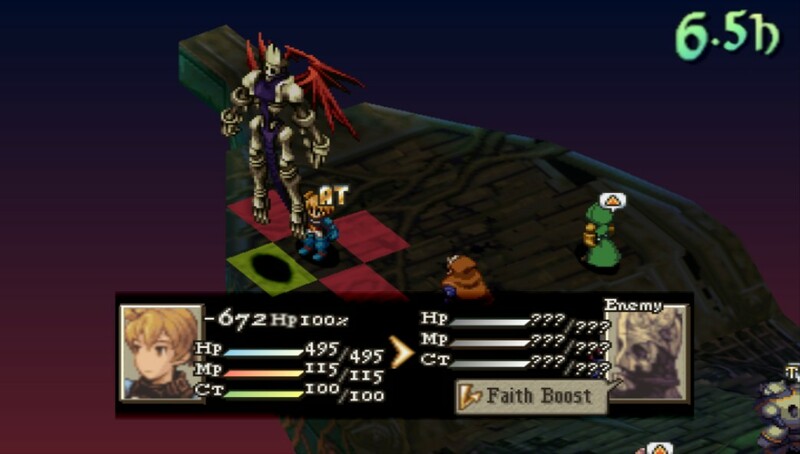 This class wasn't playable in the original PSX version, so this is pretty cool. It isn't just a cut/paste of Gaffgarion's moveset, either; there are a bunch of interesting attacks/abilities to learn that no other classes get. More on that in a bit. Dark Knight's appearance is...odd. Sorta resembles a Judge from FFXII, vaguely. 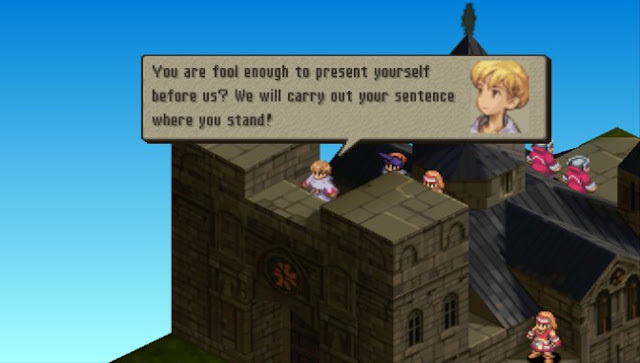 We won't see it in motion since Ramza's look never changes, much like the GOP's opinion of Obama. The Dark Knight moveset is interesting. Some new stuff here. 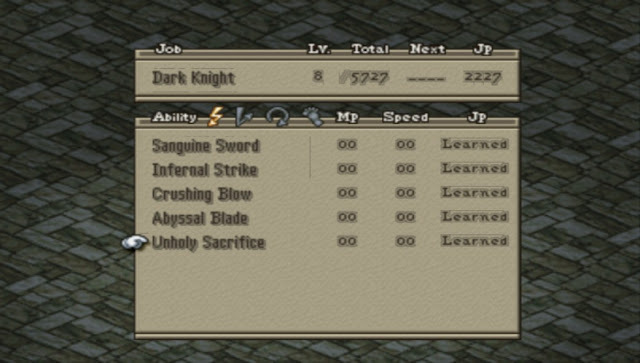 Sanguine Sword is your typical Dark Knight HP-stealing attack. 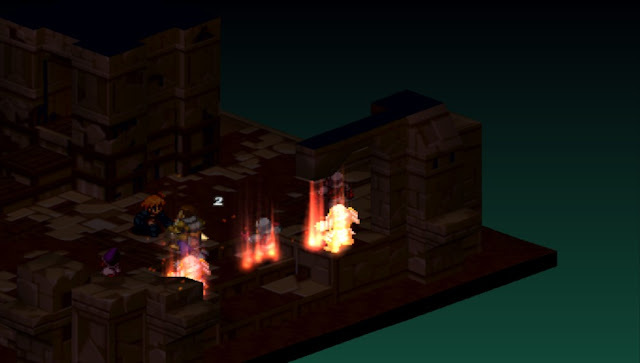 Infernal Strike is similar, but steals MP. 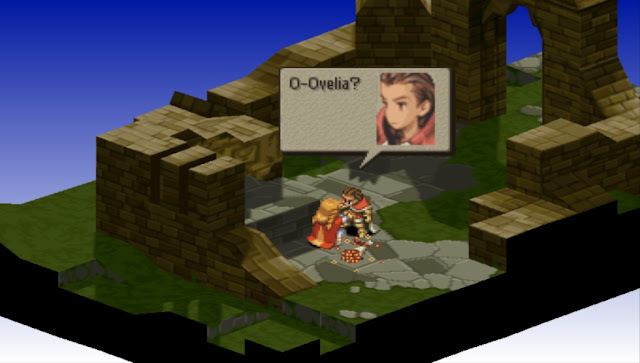 Orlandu also gets both of those. 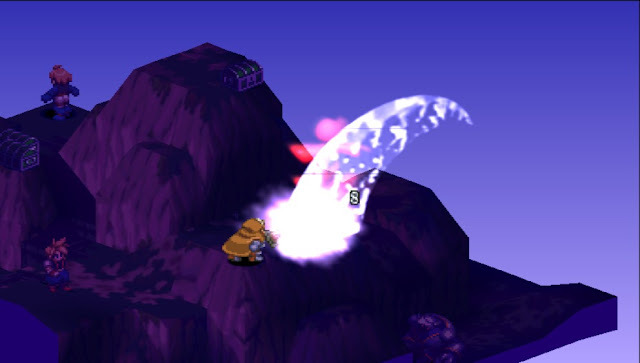 The newness starts after that: Crushing Blow is a decent ranged attack that sometimes inflicts Stop. Abyssal Blade is essentially a Shockwave attack that goes outwards in a cone and does more damage to closer foes. 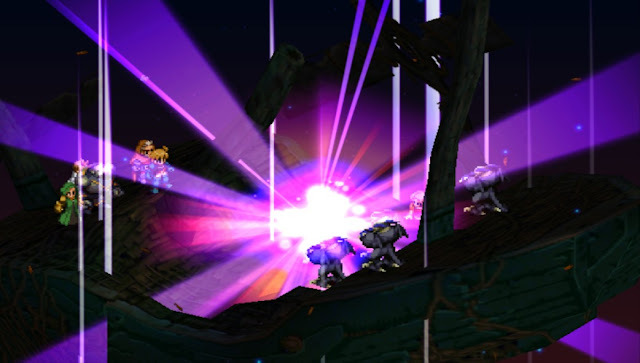 Unholy Sacrifice unleashes an explosion that damages all enemies gathered around the user. 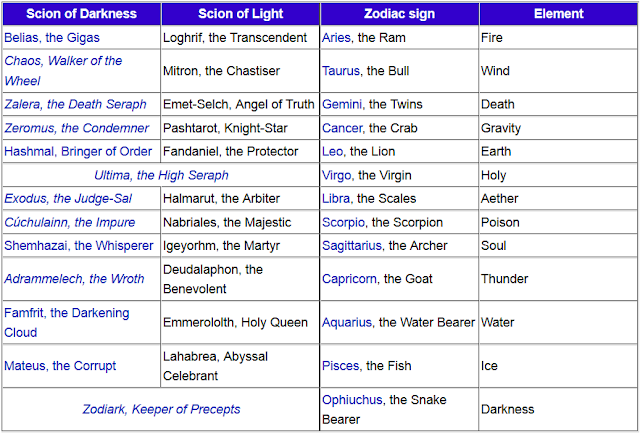 All of these are excellent abilities in their own rights, but the two area-effect moves at the end of the list are the winners on usefulness. 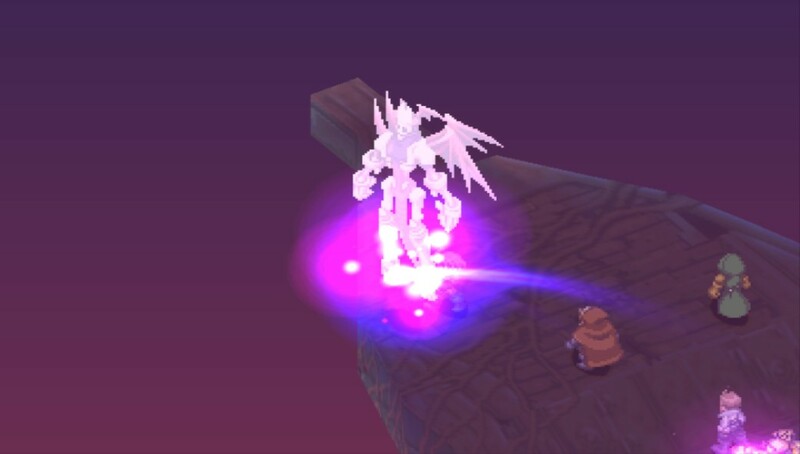 Dark Knight also gets a couple of very nice support abilities. 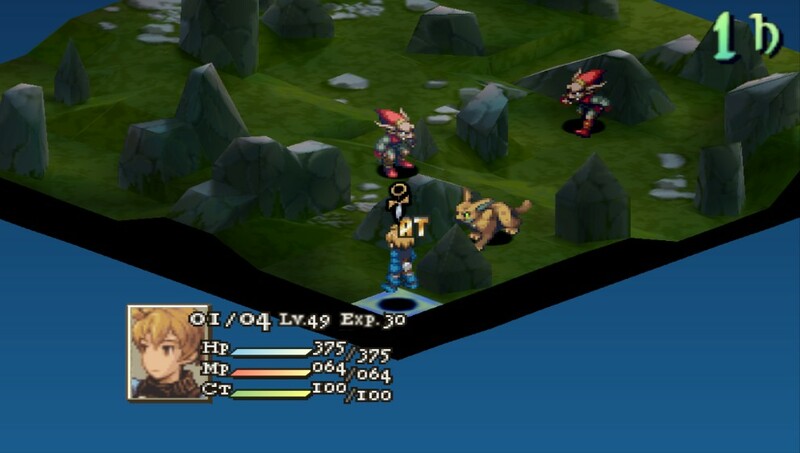 HP Boost adds a flat 20% HP bonus when equipped. This is very nice, but not all that needed at this point. 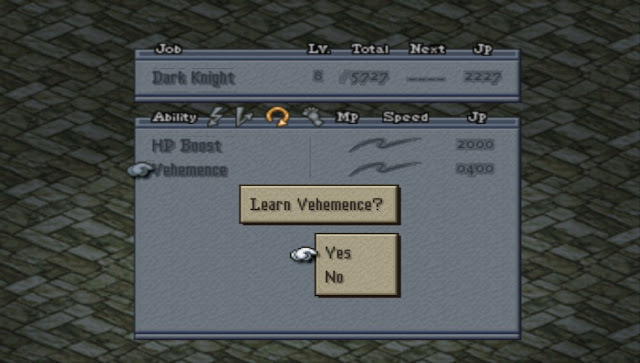 Vehemence is more interesting, and adds FIFTY PERCENT to your attack power... while cutting your defense in half. So if your attack and defense are 100/100, they go to 150/50 with this equipped. Not exactly an equal boost (that'd be 200/50) but numerically similar enough. 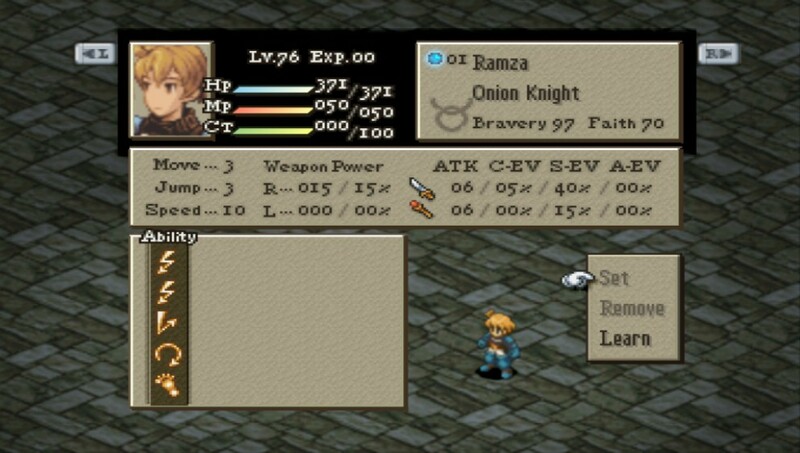 This could be insane on an assassin-type character who doesn't get hit, like what I'm doing with Ramza currently. I'm guessing that combining it with Blade Grasp would make for the most OP character ever. Only problem is that Ramza needs that support slot for Dual-Wield to continue my current methodology. 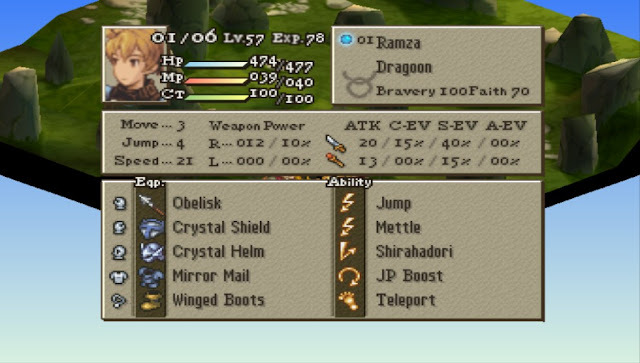 Here's my final Ramza setup. Giving him Orlandu's sword and accessory to make him the ultimate mega-character. 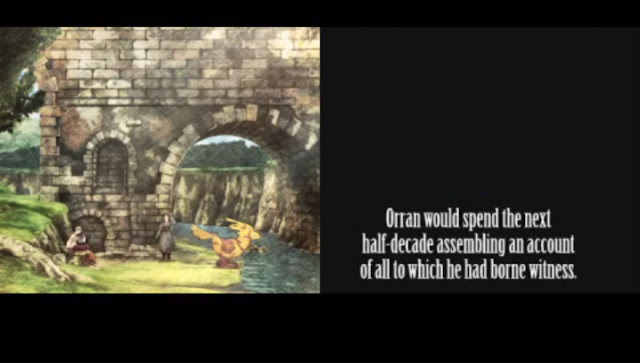 Orlandu is now...still overpowered, but more in line with other characters. He's about on par with Meliadoul, maybe half a step ahead. Meanwhile, back at the ranch! The NWO murders a bunch of clergy as their quest for power continues. Unfortunately for them, Ramza has most of the Zodiac Stones at this point. 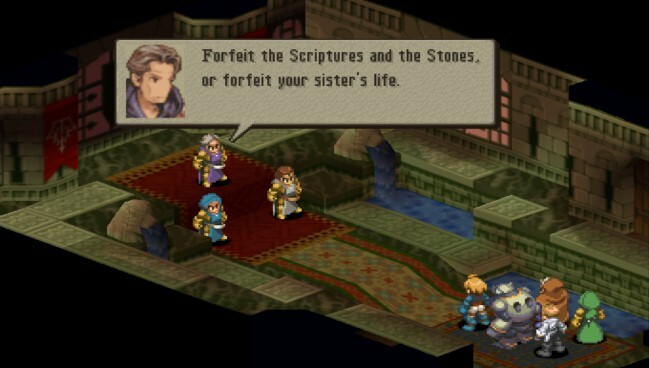 Ramza arrives at the monastery to save the day, only to have the guards outside go "keel the heretic" and throw rocks at him. 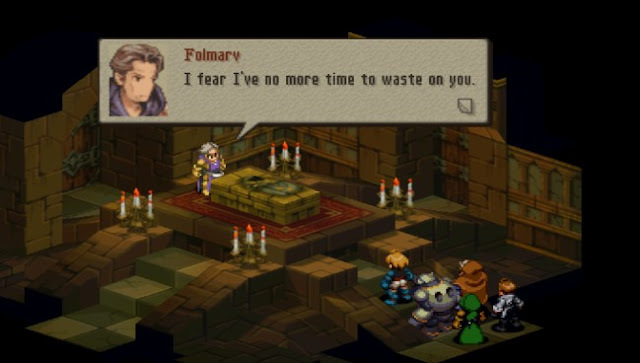 Vormav lays down the law. Normally, this is where the NWO will offer their formidable opponents some NWO shirts, welcoming them to the fold (so to speak). In this case... no shirts are on deck. Vormav wants all of the Church Loot that Ramza has, and that's it. Here's the first of the Dark Knight abilities that the new class utilizes. It's a mid-range attack that blasts a single enemy. Not bad. After winning a couple of skirmishes against the lesser NWO-ites, Vormav gets fed up and confronts us in a crypt. His newest tool of menace: Zalbaag. Ramza's estranged brother is under some sort of mind control, forcing him to fight. It's no use. The good news is that Zalbaag isn't the unstoppable monster that the game sorta built him up as prior to this point. He's your typical Holy Knight, less Orlandu and more Agrias. Defeat him, and he explodes in a glorious flash of red electricity. Yikes. 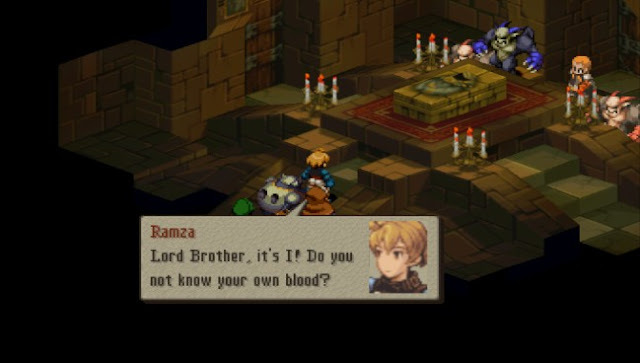 Ramza has now lost both of his brothers. And his parents. And even Boco. His sister is all he has left. 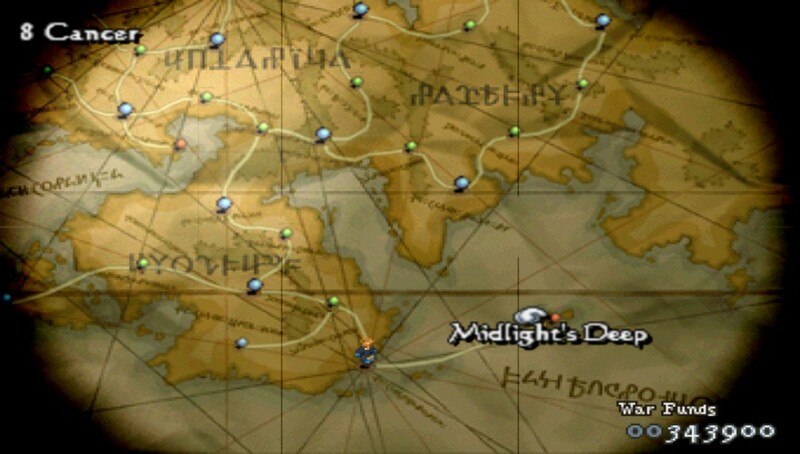 I considered tackling the optional postgame dungeon: Midlight's Deep (Deep Dungeon in the PSX version). 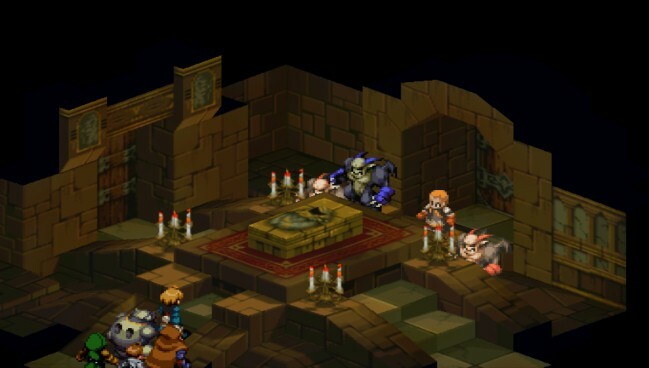 As far as postgame stuff goes, this isn't my favorite dungeon ever. It's dark and tedious. For a lot of the dungeon, you can't see anything. 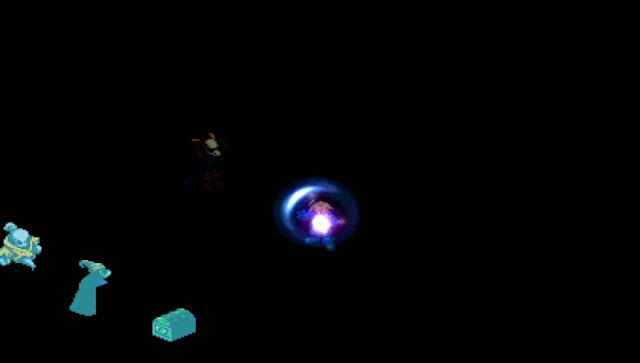 As you defeat enemies and they turn to crystal, the areas light up. 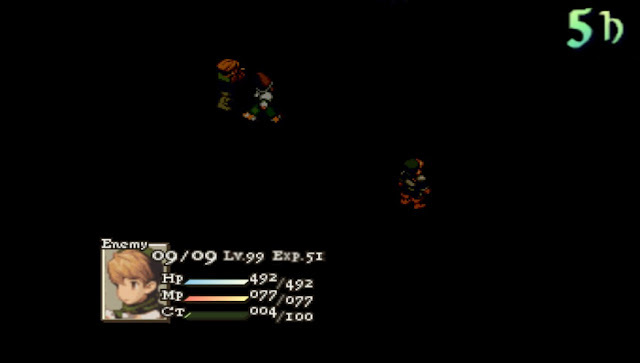 There are ten or so floors of this madness, packed with some of the strongest random enemies in the game. 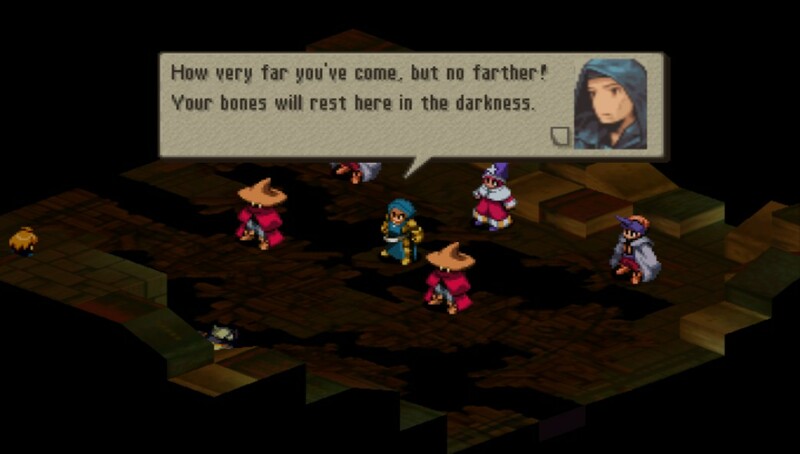 The music here is great; it starts out low and menacing, then breaks into a triumphant ballad that seems to go "we're near the end". 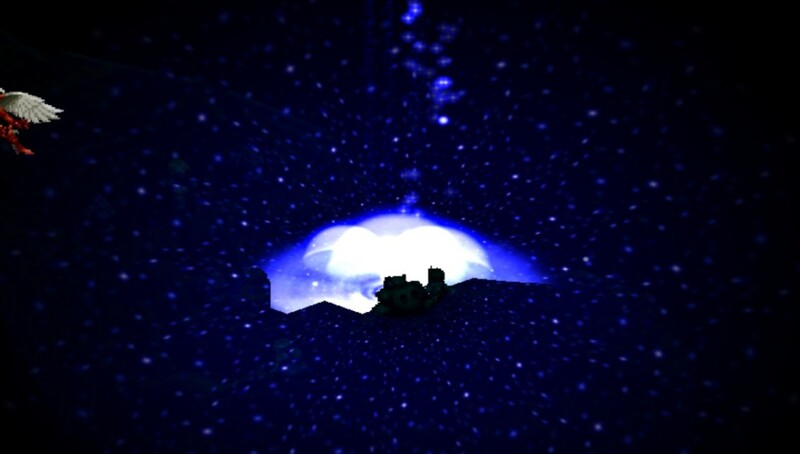 A glimpse of the cave terrain that makes up these stages. What's the point of playing them, you ask? 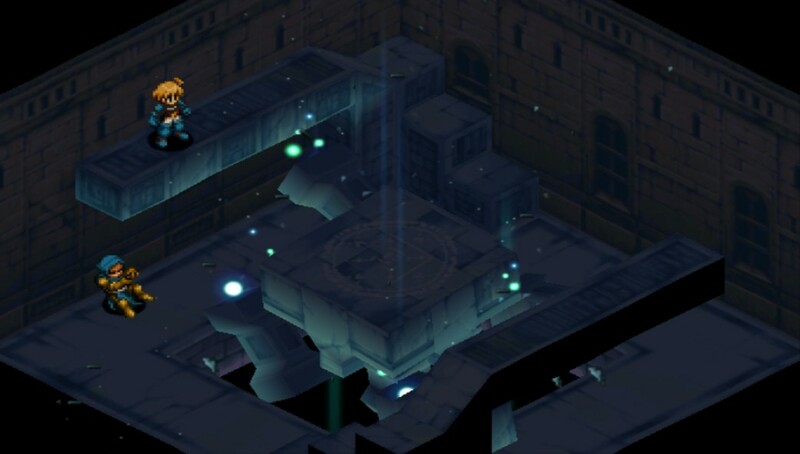 Going in with Treasure Hunter / Move-Find Item allows you to find all kinds of super-potent equipment. Even my mega-overpowered Ramza has some issues in these stages because so many of the enemies use special attacks that ignore standard defense and magic defense. 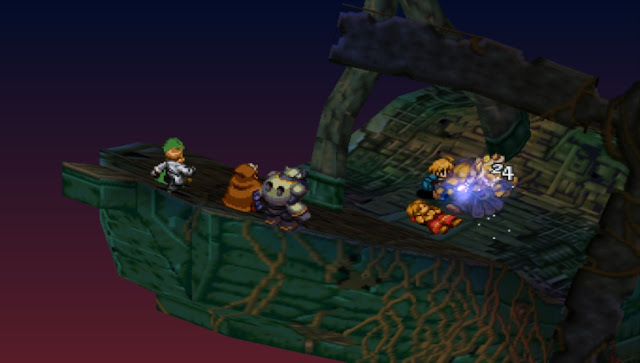 The enemies here are uniformly level 99, given that they all scale to Ramza's level. This makes them significantly stronger than the enemies in the final areas of the "story mode". 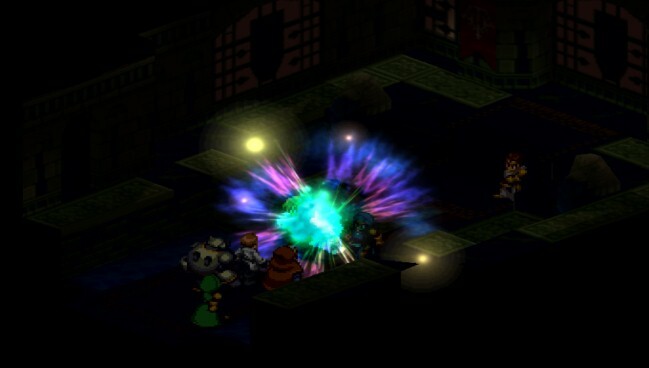 Quick shot of Ramza dishing out Unholy Sacrifice, the strongest Dark Knight move. 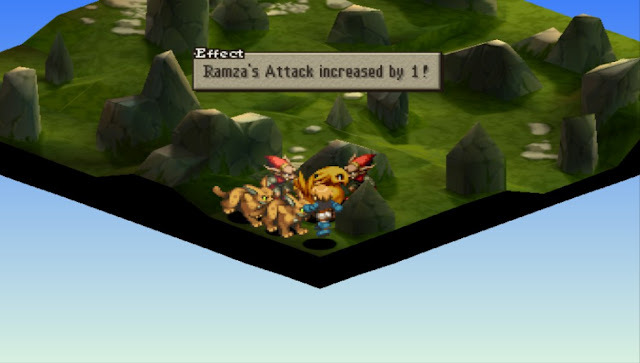 A fearsome AoE, the only downside to it is that it also damages Ramza. 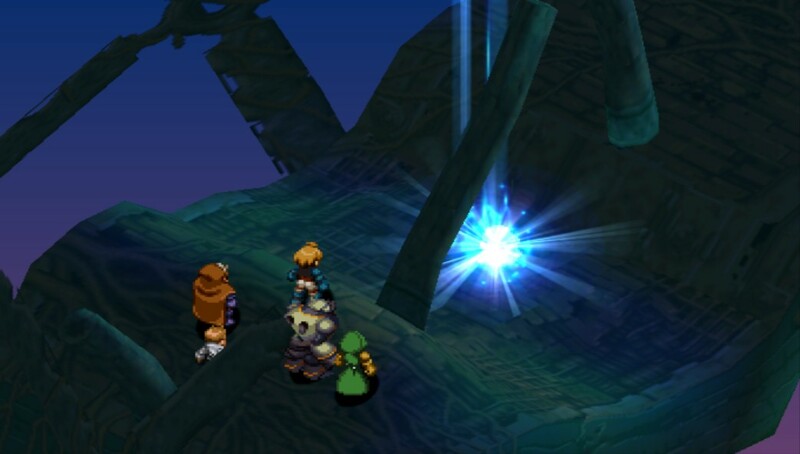 Still, it's a great thing to use after teleporting into a group of enemies. Get to the end of the dungeon and you face Elidibs, a stray Lucavi demon who possesses the secret 13th Zodiac stone, Serpentarius. 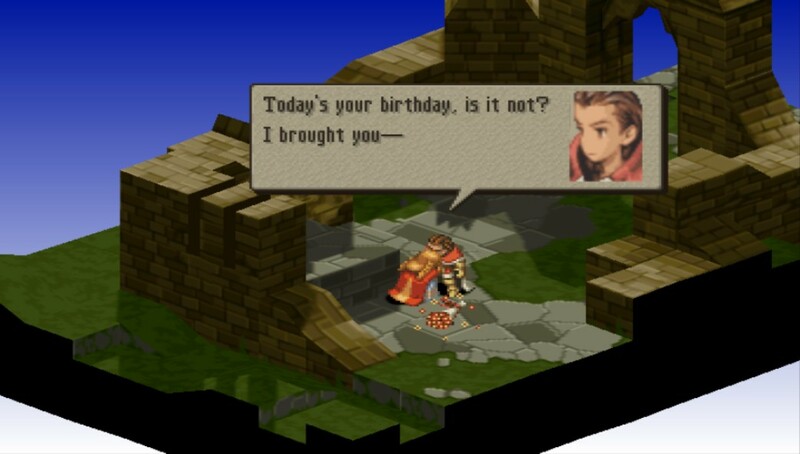 Here he is from the PSX version, because I have no intention of playing through Deep Dungeon again on this playthrough. Elidibs/Serpentarius summons Zodiark, the most powerful summon in the game. In Final Fantasy XII, Zodiark here is the 13th demon. 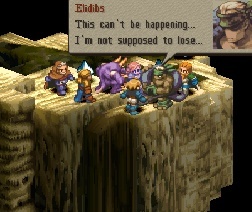 It's odd because you'd think Elidibs would be. 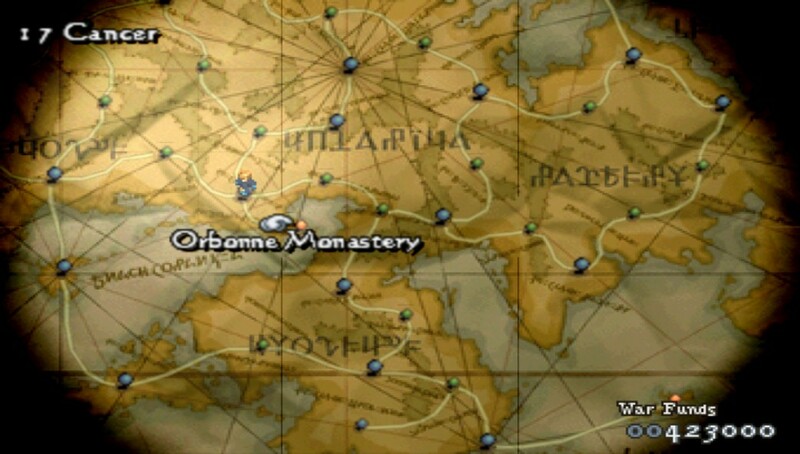 Finally, we end up back where we began: Orbonne Monastery. The final set of battles are found here. 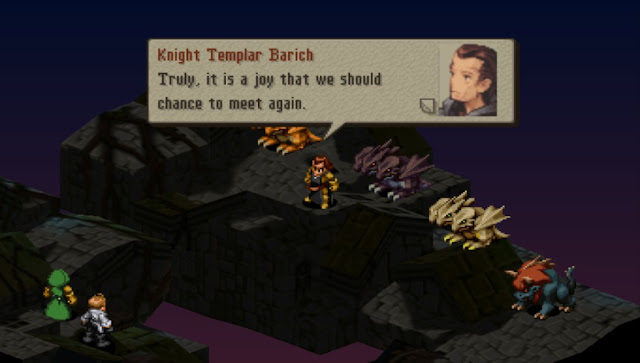 It's basically a series of fights against the Temple Knights. You'd think they'd all be Lucavi at this point, but Vormav didn't have enough Zodiac Stones for that. 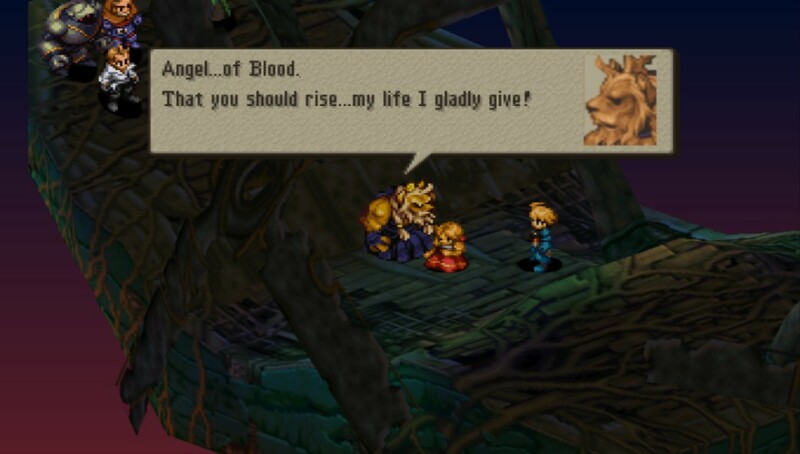 ...they still act like Lucavi demons, though. I don't get it. Defeat this blue guy and he casts open the gates of Hell Itself. Uh oh. 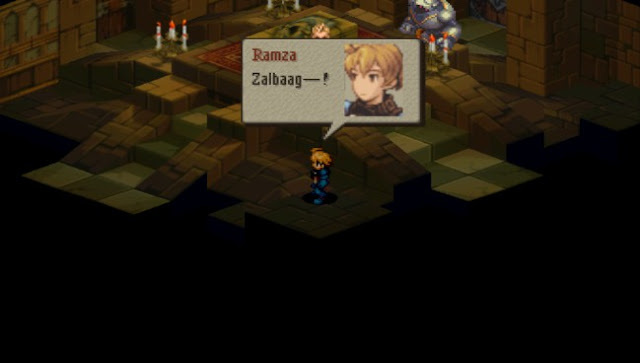 From here, there's no going back for Ramza and company. They're essentially stuck, barring some unforeseen miracle. 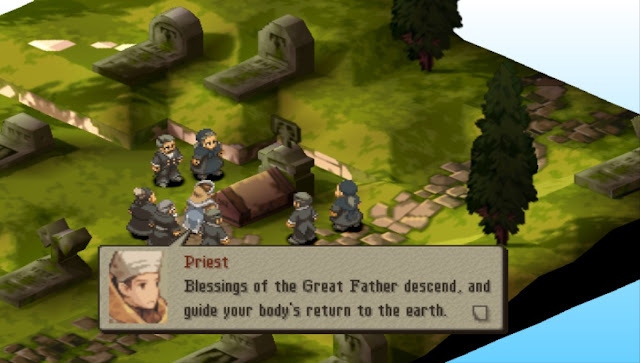 I don't think they're actually going into Hell, but rather a strange underworld full of ancient relics. Vormav's other goon is the next to stand up to our heroes. We briefly fought this guy earlier in a forgettable skirmish. 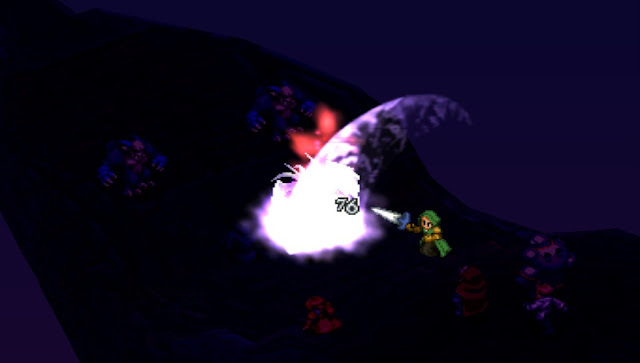 Ramza teleports right up to the enemy group and unleashes destruction with the Dark Knight cone-wave attack, one-shotting the boss and several other enemies. Moving on. Just as I wondered who was left, Balk (as per the PSX version) makes a reappearance. 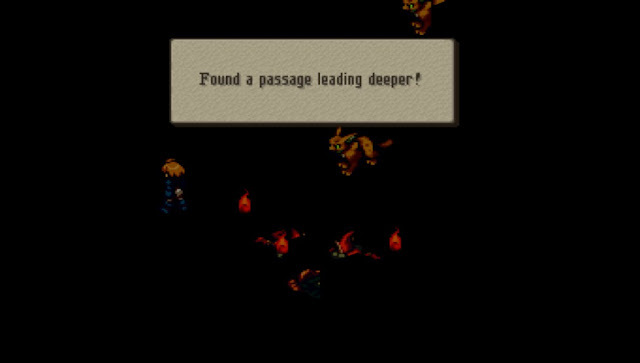 He's got a bunch of monsters in tow, which makes sense because he's a beast master. He's more difficult to take out early than the other knights. 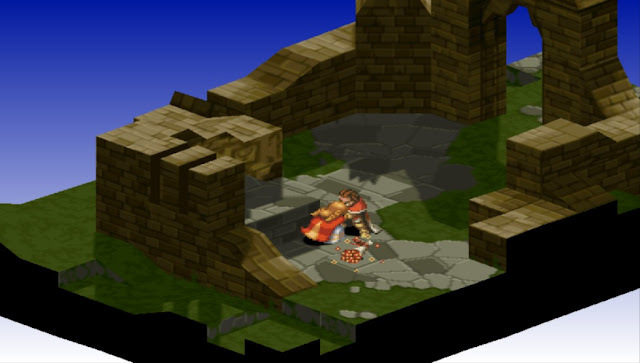 There's a pit crossing the stage that makes it difficult to get your characters to him; in my case Ramza was able to teleport across and gank the Chemist, but then it's a matter of him surviving long enough to get a second round and knock off Balk. 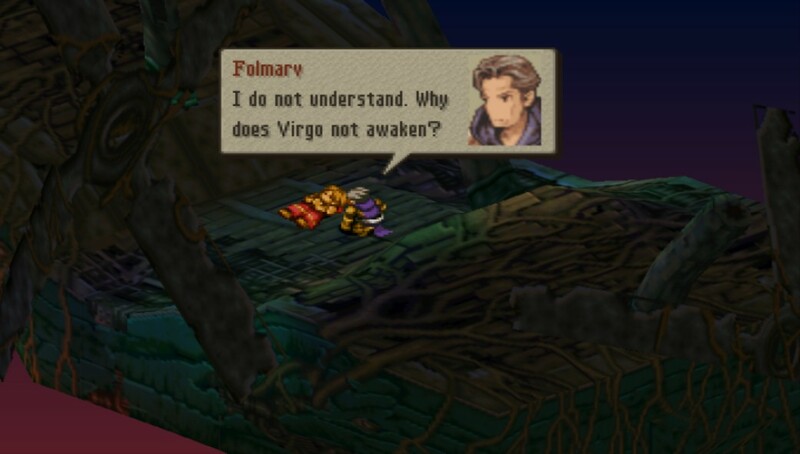 Volmarv, meanwhile, is feverishly trying to wake Alma up. He's like Mirror Universe Bill Cosby. Our heroes arrive. This is an ancient airship graveyard, filled with relics of a lost civilization. 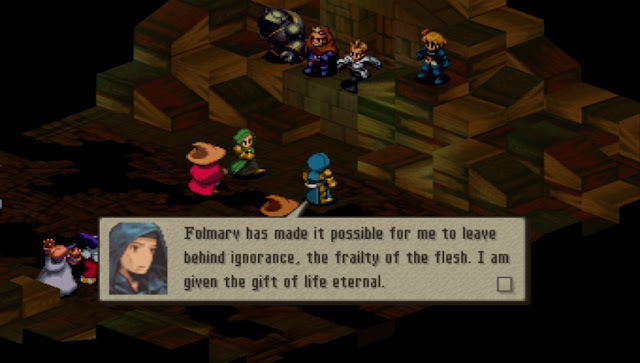 Vormav needs a little more blood to revive St. Ajora, so he'll fight us himself. 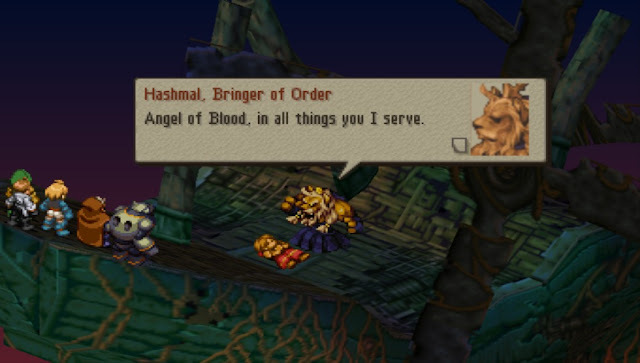 Hashmalum (as per the PSX version) is the fifth and final Lucavi demon, the leader of the pack, the man with the master plan. 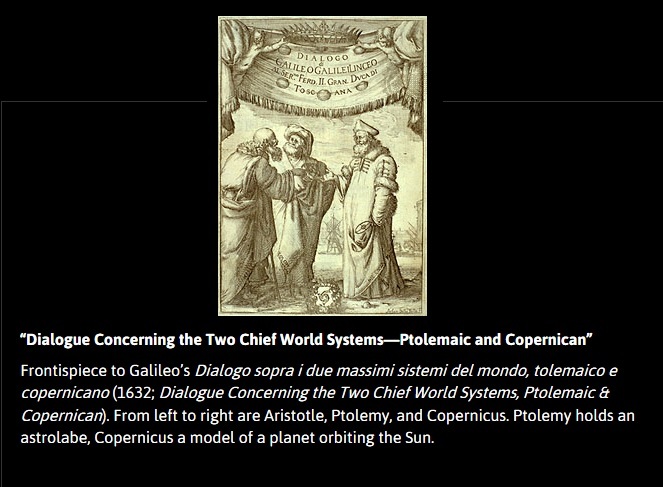 Even he...is no Velius. Hashmalum is Earth-elemental and the Lucavi from the Zodiac Stone of Leo. Makes sense given how lion-esque he is. He's very weak, and falls to a Ramza attack followed by Balthier dishing out a Barrage. Since he can't have our blood, Hashmalum offs himself to get the last bit of needed blood. 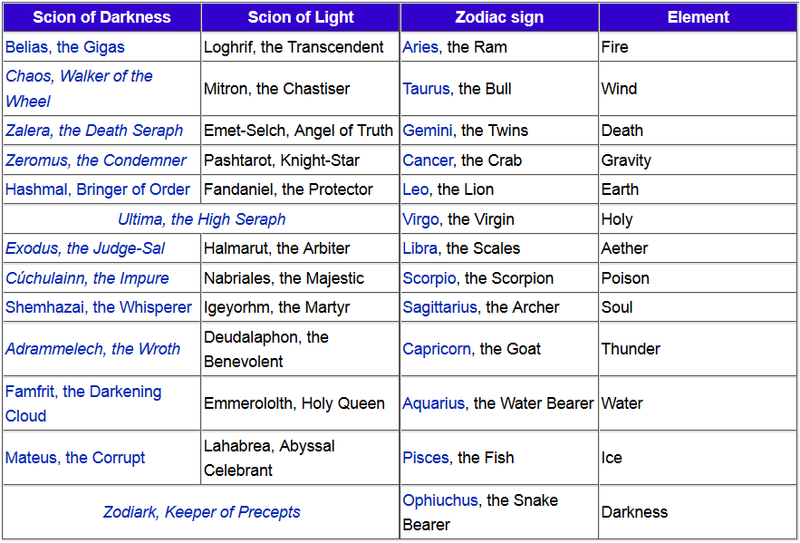 This results in Virgo activating, and Alma gets possessed by St. Ajora. The leader of the Zodiac Braves, including the five Lucavi. 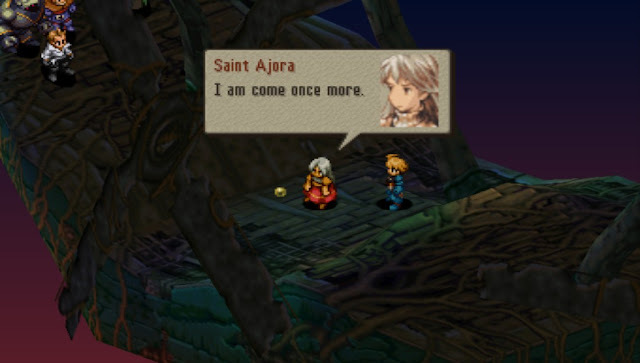 Like the Lucavi, St. Ajora talks like someone who hasn't spoken in a thousand years. Probably because that's indeed the case. Time for some Quantum Leaping as St. Ajora powers up and becomes the Zodiac demon of Ultima, the High Seraph. 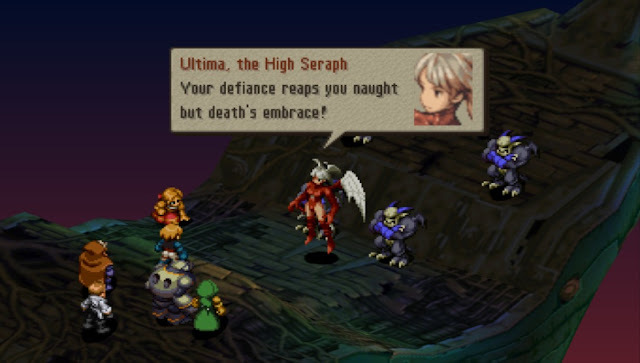 Ultima is ready for battle. Like Zodiark, this creature was part of the top tier of Zodiac demons in Final Fantasy XII. I think the only other one on that tier was possibly Chaos. 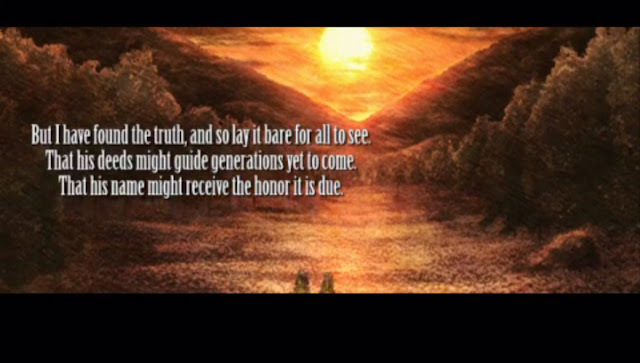 The first theme for the final battle. This one is fast-paced; it used to be my favorite of the two final battle themes. More on that in a bit. Ramza dishes out DK power! Meliadoul's attacks are very effective here, unlike the PSX version where she could only use her rending attacks if the enemy had equipment to rend. Ultima attacks with - what else? 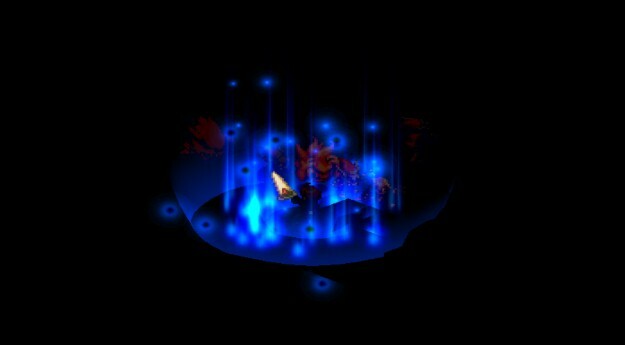 - the Ultima spell, and a significantly beefed-up version of it from what the assassins used earlier. Win that fairly simple fight, and Ultima goes to form two...complete with lots of Leaping. The theme for this fight is darker and creepier. I mentioned how I used to like the first theme more, but now I find myself liking this theme. Wheras Ultima's first form is an angelic babe, Ultima's second form is an undead weirdo. 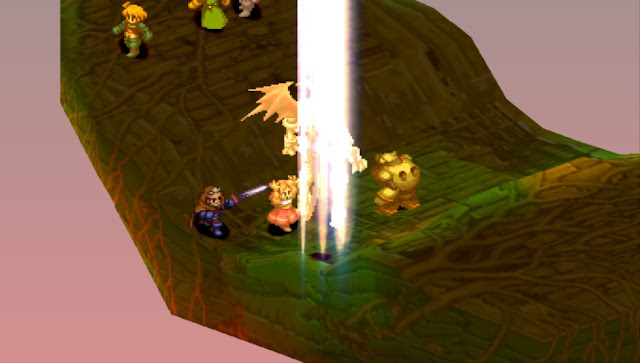 The good news is that Ramza can easily trounce this form with dual-wielded strikes. Construct 8 adds his lasers to the mix! 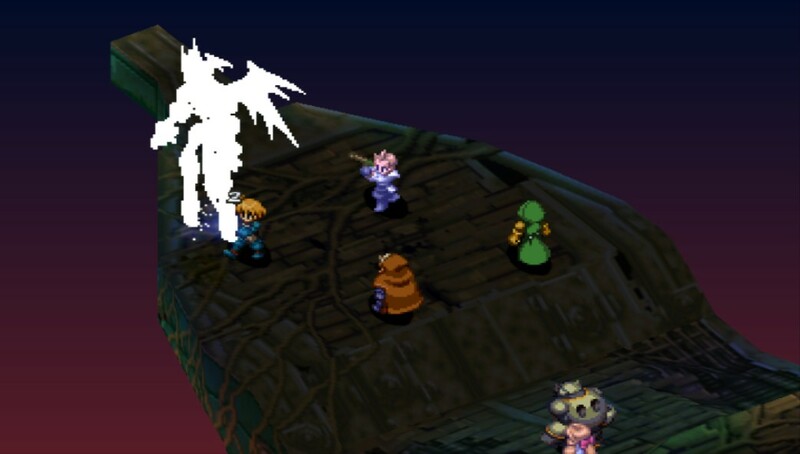 Most Final Fantasy final bosses have some sort of huge mega-attack, and Ultima is no exception. Orlandu dishes out Holy Explosion PRRRRRABADOOOOO! The problem with this final battle is that Ultima still doesn't have enough HP relative to your characters to really be a major challenge, even with two forms. Also, Hashmalum barely had any more HP than Velius, a persistent problem with the Lucavi demons in this game. The bosses don't seem to scale upwards on the trajectory that they probably should. ...Ramza does not, due to being a heretic. Delita, meanwhile, is rolling in the hay with Ovelia and taking all the credit for uniting the world. Well, no one said life was fair. Wait a minute, what's that music? ::Orlandu leaps out of the dirt and AA's Orran:: PRRRRRRRABADOOOO!! Er...anyway, Orran went on to write the story of what transpired here and how Ramza and company saved the world. Oh, and they didn't really die. We don't know how, but they got out of the underground hellscape somehow and fled to another nation to live happily ever after. 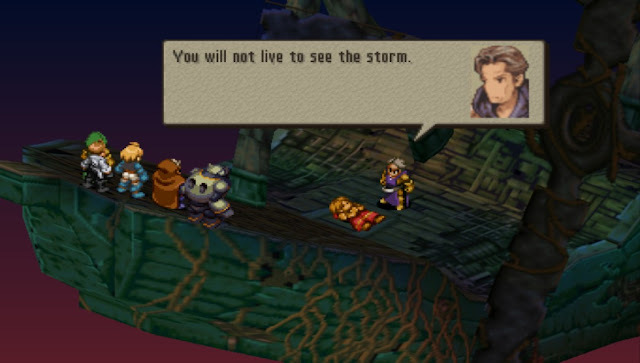 Here in Ivalice, the truth is hard to come by. Now Arazlam knows what it's like to work at Fox News, at least. 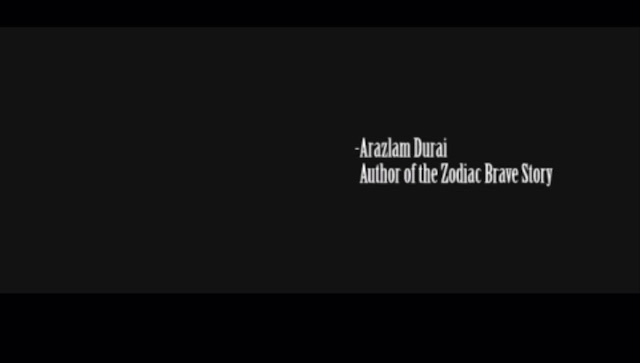 Of course, the real world has its own version of the Zodiac Brave Story, the burial of science. But that's neither here nor there. Delita responds to being stabbed by taking the knife out and stabbing Ovelia with it. Not only is she dead, now she has any bloodborne illnesses Delita has. "Enjoy the Hep C, you ungrateful harpy!" he bellows while limping away. 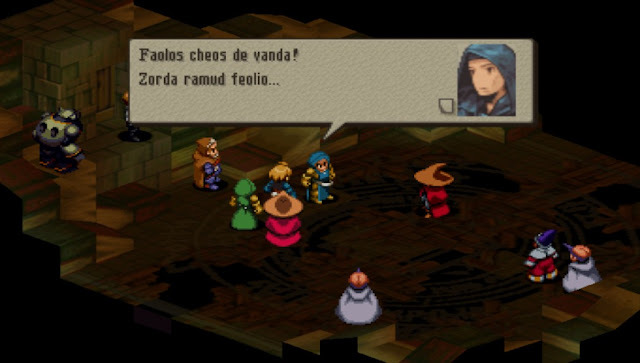 Not really, Ramza is "dead". Come to think of it, everybody's pretty much dead. 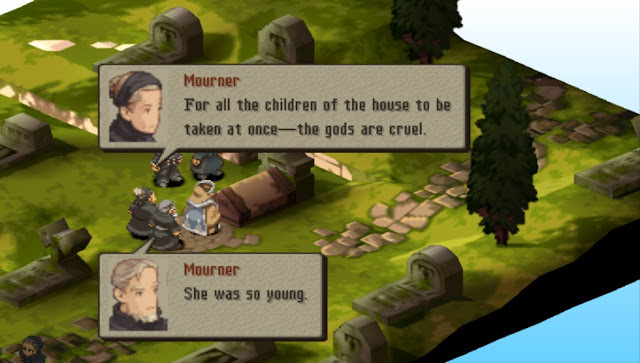 This game is depressing. I need to get going. 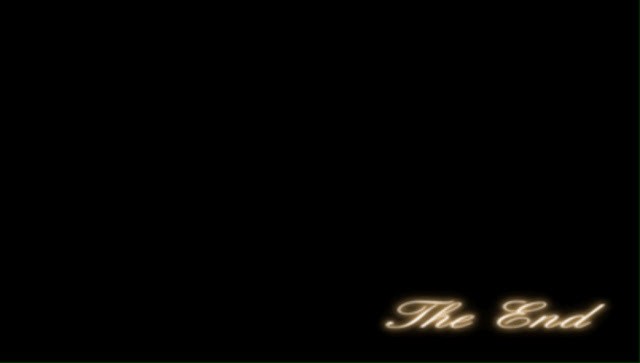 That concludes the playthrough. Tune in tomorrow, or maybe the day after, as I do one more post looking at this game. Dycedarg's Theme. 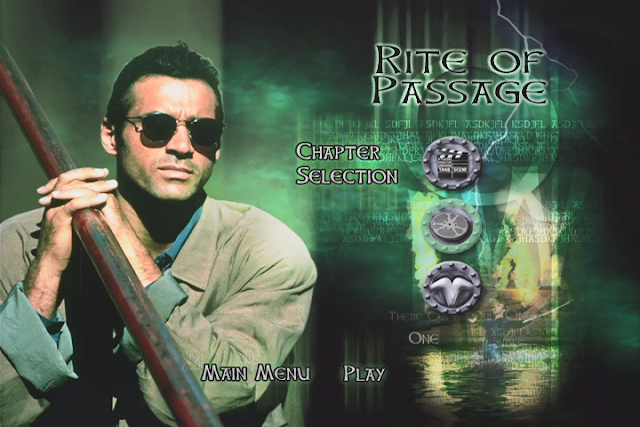 This plays during a lot of the "political intrigue" segments. It's one of the best palace themes I've heard. 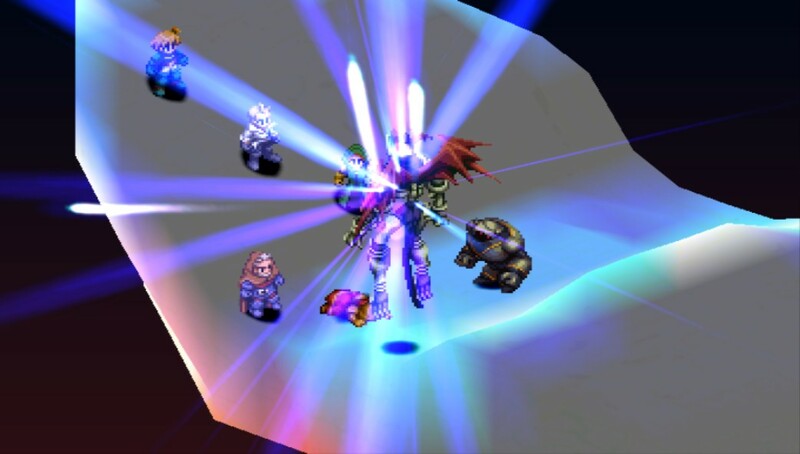 Thunder God Cid / Orlandu's Theme. Contrary to popular belief, his theme isn't PrrrrABADOOO. This one is equally triumphant, though. One of the more peaceful (and rare) battle themes. This is absolutely a "falling snow" theme, and would be at home in any ice-themed area. 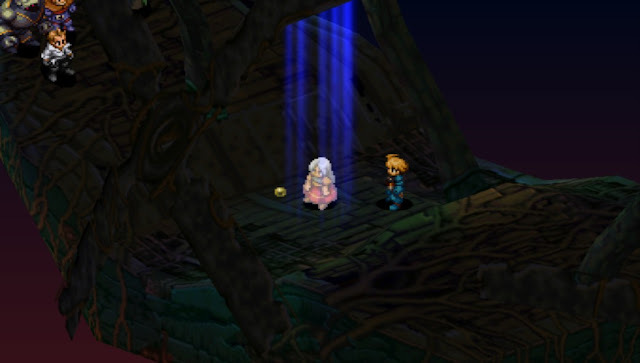 Alas, it plays during the fight with Izlude in the library, which doesn't have any falling snow. Wow, great shot at the start there. You do need to master other classes to make Onion Knights viable, but their real selling point is what they do with the Onion Equipment. With everything mastered and their full equipment they're wrecking machines. ...you can only get Onion Equipment from multiplayer though. If you look at the FF3 sprites (or the new 3D models) for the Dark Knight, you'll see where FFT got the design from. That Ramza could just about solo the whole game. 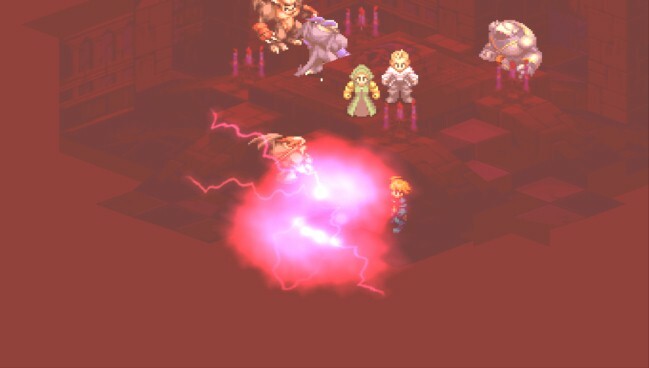 It is nice in this version to finally be able to give him magical sword abilities as those are what dominate this game. 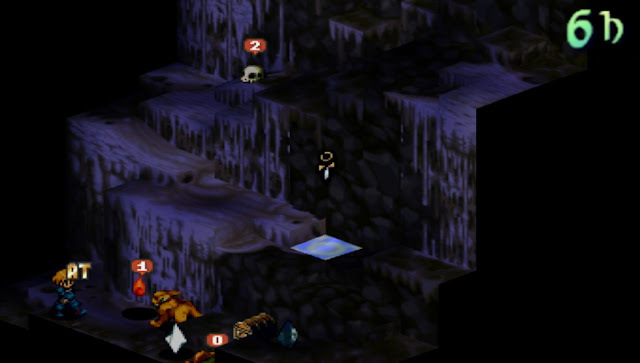 Yeah, that Deep Dungeon music is really good. Good job finding Gimli, the secret fourth guest character. 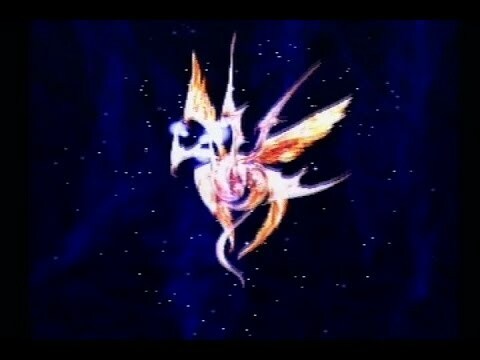 The final link is another of my favorite battle tunes. Fantastic. 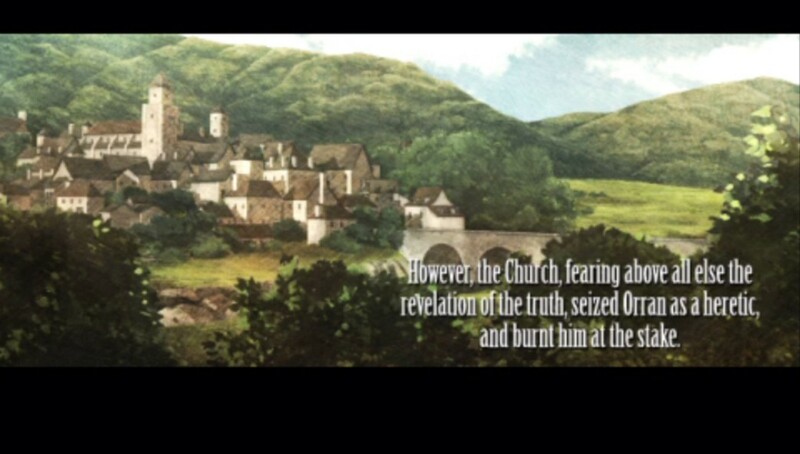 This Lucavi thing is a nice pseudo-connection to European folklore. Onion Knight seems like a fun one for powergamers. I'm glad it's around. 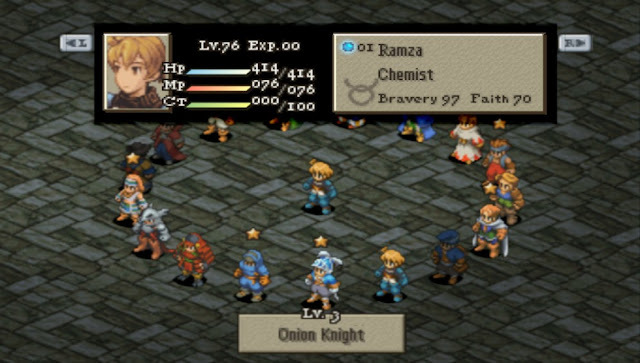 Ramza is at LEVEL 89?! 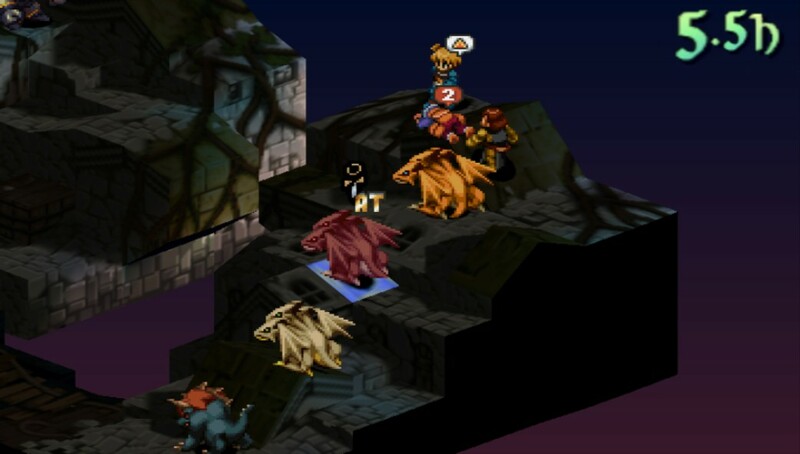 Avoid chocobos! But it must be fun to have such a strong character. 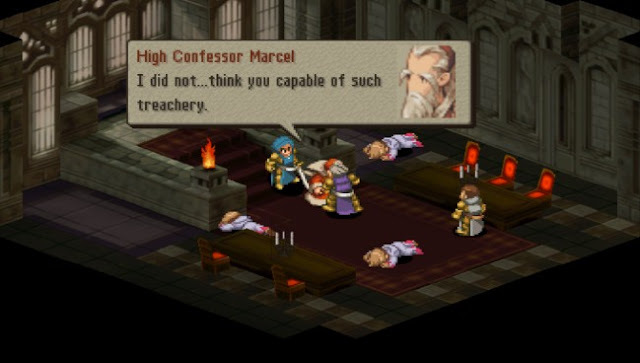 Poor Marcel. Civil wars are thorough. 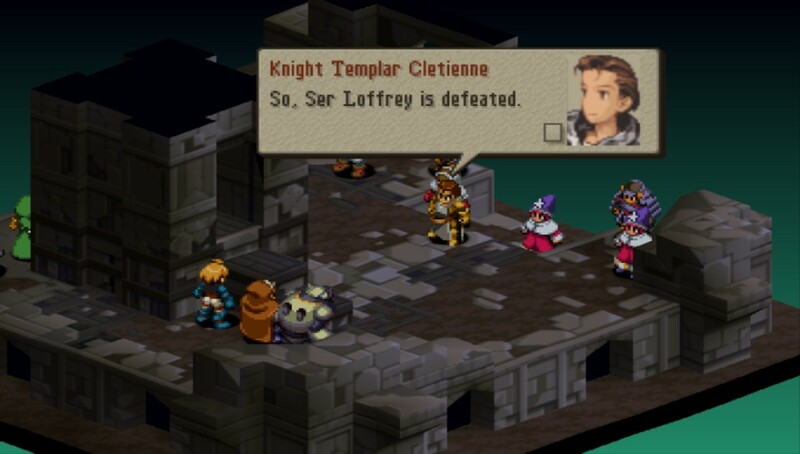 Getting to the end here I'm really thinking "Man, Delita got off easy, while Ramza did all the work." 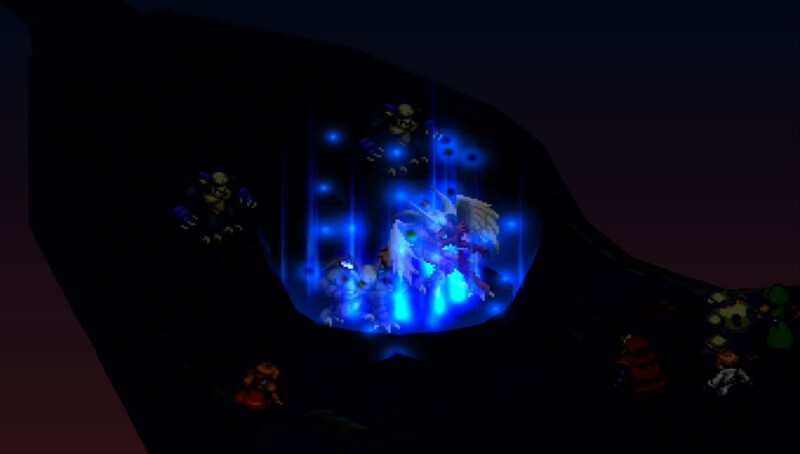 I never did the Deep Dungeon, so the reveal of a Lucavi down there was a real surprise. 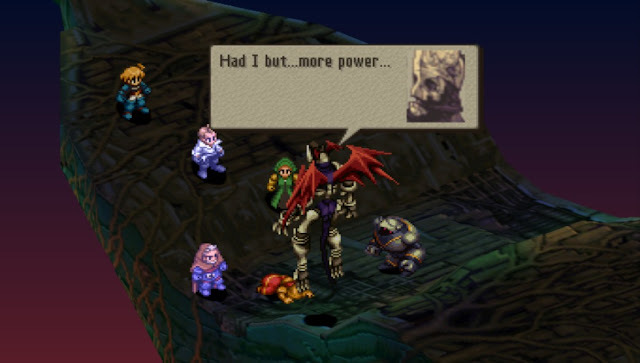 I suppose with the Lucavi they had a theoretical argument that they should all be equivalent strength, though it didn't work out that great for conventional game purposes. I remember this descent into hell well. Balk coming back was good. 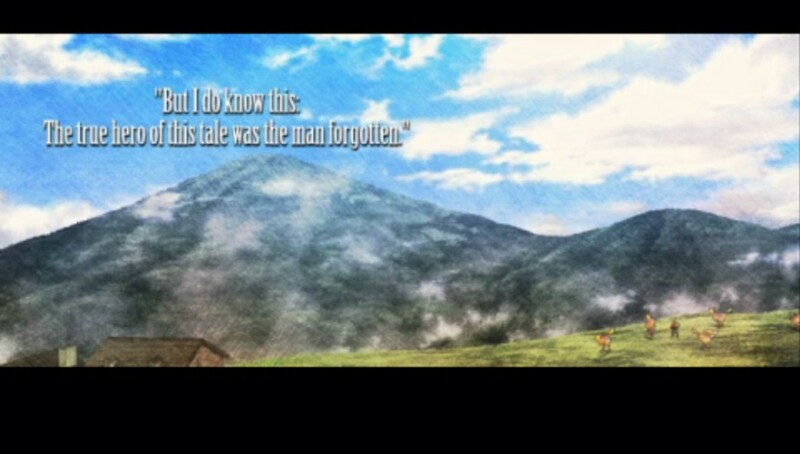 He was memorable. 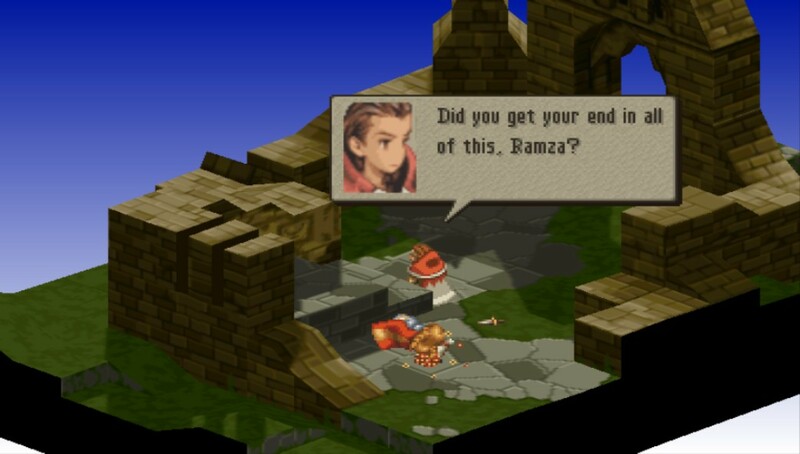 Poor Ramza even has to fight "his sister" in the end. It's interesting they really did the "transform into demon" thing credibly from an artistic standpoint though. 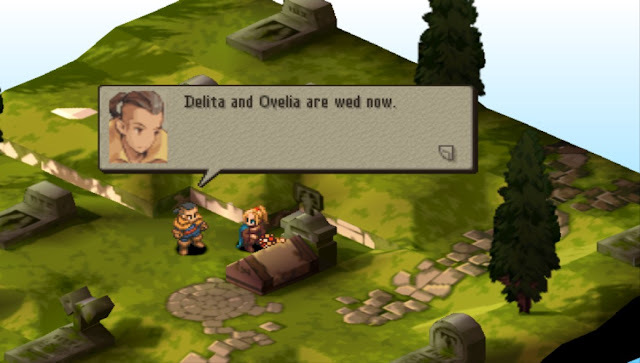 Ramza and Alma and the party lived, man! And they moved to Canada. This last scene is an all-time classic.